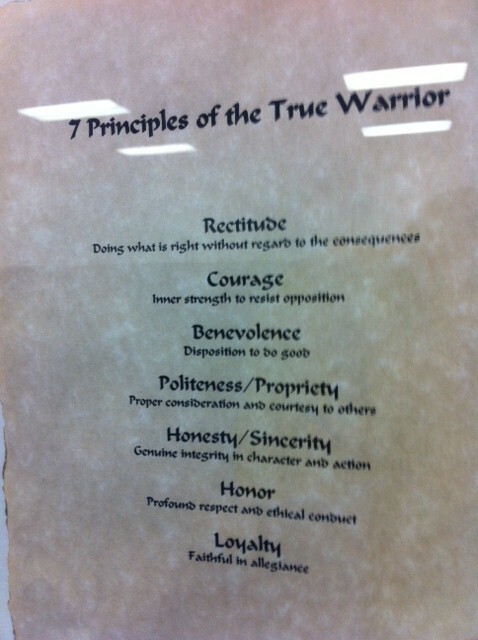 Do you know the Seven Principles Of A True Warrior? The seven principles are on a wall at headquarters. I almost have them memorized word for word. With some discipline, I found an easy method to memorize them. Here is how: Learn one sentence at a time by saying the word and repeating the definition 108 times out loud. For example, say out loud, “Rectitude: Doing what is right without regard to the consequences.” The next day, ” Courage: Inner strength to resist opposition.” 108 times. The next day, ” Benevolence: Disposition to do good.” 108 times. “Politeness/Propriety: Proper consideration and courtesy to others.” The next day, ” Honesty/sincerity: Genuine integrity in character and action.” ” Honor: profound respect and ethical conduct.” Finally,” Loyalty: faithful in allegiance.” By the end of the week, you will have memorized the seven principles word for word. Once, learned try to say the principles once a week to keep it fresh in the mind. This is something I don’t want to forget. Jiu Jitsu is away to leave behind the old bad you, and create a new good better you; well, that is what I want my training to be. October was the last time I attended an Advance class. Half the class were brown belts. I felt like the waterboy. I kept quiet while they chatted before class. They have known each other for years. I made the mistake of pairing up with a fellow blue belt who was trying to learn the lesson for the first time. In the fundamental’s class, I know what is going on but in the advance class, I am the waterboy. I was struggling to learn a spinning armbar from the guard. Next advance class, I will try to pair up with a brown belt. There are a lot of lessons to be learned in Advanced. Wow, another mountain to climb. This was lesson 33. I know that jiu jitsu is mostly experience and very little book learning; however, I need a notebook. Blue Belt Week 65, March 15, 2012. In our life, a lot of present time goes un noticed. I’m trying to live in the moment. Right now. Not the past. Not the future. There is little benefit in dwelling in past memories. There is little benefit in worrying about the future. The eteneral present which is really the only time there is. As we lined up to bow to our professor on Friday’s fundamental class, I was the highest ranking belt, a first time experience. However, a little later, a purple belt and a brown belt showed up late. I didn’t feel conformtable being the one being looked up too, not yet. I thought to myself of my very first class which was a distant memory and here I am now. For me, the joy of the journey isn’t the final destination, black belt, but the journey to it. Longevity. I am now taking vitamin D3. I was shocked to read that 100 million Americans, out of 300, are vitamin d deficient. A chronic low level could lead to cancer. Your body needs direct sunlight to make it. So, if you don’t get out in the sun very often, you should get tested. You body needs vitamin D for skeleton and muscle health. You need a blood test to know the actual level. I had a great class on Tuesday, the advanced grappling. We worked on a pin and a technique to maintain it. I am feeling confident I could keep the Russian strongman pinned with the technique we just learned, unless he out smarted me. It is a fact that Russian’s are great fans of chess which jiu jitsu is similar. I have to depend on technique. Professor Pedro is going to teach the nine pins in the coming weeks which is something I knew about when I was a kid, they didnt teach everything at onetime, but wanted to learn but didn’t. So, I am looking forward to the coming weeks. That was the only class I could make because of the flu. I got it from my kids. Anti aging stuff. I wouldn’t recommend Flex-a-min double strength, glucosamine. I’m now trying Kirkland Glucosamine HCI 1500mg with MSM 1500mg, 375 tablets, 2 times a day. This has 3x MSM than flexamin and it was 3 tablets a day. Side note, Costco, besides selling cheapest gas in the area, they have great supplements at low prices. I started taking two baby aspirin, Kirkland, 162 mg, at bed time. There are some risks which you should consult a doctor before starting this.